Members of the Tennessee Press Association held their annual meeting in Chattanooga's stately Stanton House. On June 4, 1895, the Tennessee Press Association executive committee chose Chattanooga for its 25th annual meeting. The Stanton House served as the host hotel for the convention. Built in 1871, the Stanton House was constructed on the site of today's Chattanooga Choo Choo and was a key part of the town's railroad heritage. 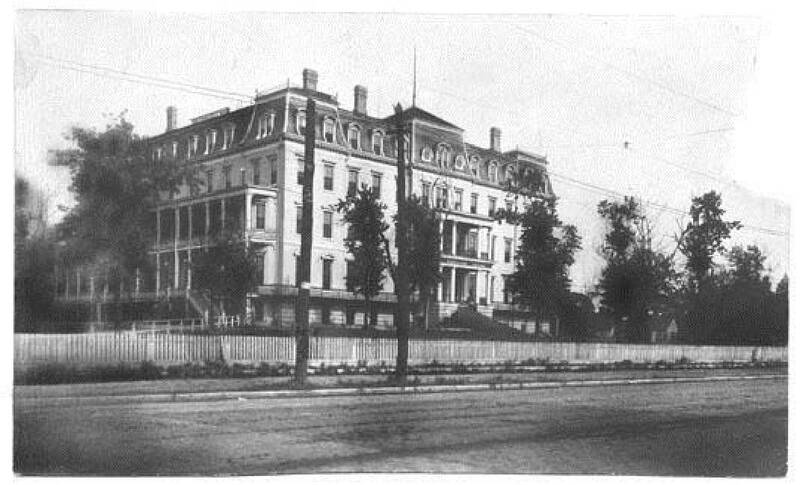 The hotel rates for the convention were $1.50 per day for both the Stanton House and the Rossmore House. Read House rooms were priced at $2 and $2.50 per day. A Journal of the Proceedings, a bound, purple-covered journal, preserves the "Prelude, Interludes and Appendix" of the three-day session. George W. Ochs, mayor of Chattanooga, welcomed the attendees "not as the chief executive of the city but as a fellow craftsman there is more in this vicinity to make you plume your pens and inspire you with grand ideas than you will find anywhere else in the state." Attendees were reminded often to pick up and wear their convention badges. The credentials assured: access to transportation on all lines of electric cars, the Lookout Mountain broad gauge, as well as the Incline and narrow gauge rail tracks; social messages over the Western Union and Postal Telegraph lines; and a hearty welcome anywhere and everywhere between Missionary Ridge and Timesville (today's Timesville Road in Walden). Women were informed that they did not need badges since "beauty is always at a parity with grace in Chattanooga, and both command a premium." Orator R.M. Fields read the address of TPA President H.A. Hasslock, who missed the session due to an illness in his family. In his remarks, Hasslock termed the city as "one of the liveliest, hustlingest, little-big cities of our state — Chattanooga — which a few years ago was well known as Ross' Landing, but to the younger members it is Chattanooga. This fair and thriving city is an example of what our State should be, from Memphis to Bristol, full of vim, vigor and victory; built up and kept up by the young men of today, assisted by some good advice of the young men of yesterday, who are still a factor in the State's prosperity." "How was the transformation from Ross' Landing to Chattanooga accomplished? How was the keel boat of yesterday transformed into the Warner of today? By the efforts of people who have been Tennesseans for a life time, coupled with the work of the carpet-bagger from Pennsylvania, from Ohio, from Maine, from Georgia, from Alabama and dozens of states of our Union less favored than Tennessee. Once a Chattanoogan always a Chattanoogan." When not in session, editors accompanied by wives and friends took advantage of the courtesies extended by the Electric Railway Co. and spent an afternoon at Bragg's headquarters on Missionary Ridge. Before the ride, the writer of the proceedings stated: "a party walked to the Ridgedale Springs (at the eastern base of Missionary Ridge) and partook of the 'nectar which Jupiter sips,' icy, pure spring water." Later in the day, an informal reception hosted at the top of the Times Building (today's Dome Building) was interrupted by "the weather gods who vented their wrath." The first storm of the summer season "marred the fairy landscape on top of the Times building." But the casual interactions among the convention goers was not to be halted by the rain, and the editorial rooms in the building "were invaded by the appreciative visitors." In the library "a band discoursed music, while dancing was indulged. Five hundred lights illuminated the handsome building from cellar to dome. It was a gala night at the Times office for the employees, and an interesting, instructive and enjoyable feature of the entertainment of the Tennessee Press Association at Chattanooga." The third morning session, held in the Chamber of Commerce building, was adjourned at 10 a.m. on June 6, 1895. Their next stop was at Cumberland Island, Ga., for rest and relaxation. One has to wonder whether it was the interruption by wet weather, long days of meetings filled with lengthy remarks or the desire to cast aside the required credentials that led the group to take a road trip to the coast of Georgia. For 147 years the Tennessee Press Association has provided a unified voice for the newspaper industry in the state. Today the association's website states that it assists 121 member newspapers with a number of services, including the exchange of information and ideas. Tom Griscom is a former editor and publisher of the Chattanooga Times Free Press. For more, visit Chattahistoricalassoc.org.